The Snowdon Lily is one of our most endangered plants. In Britain it is now found in only a few inaccessible (to man and grazing animals) spots in the mountains of Snowdonia. Two of Wales's most iconic National Nature Reserves in Snowdonia protect the Snowdon Lily and other rare alpine plants: Snowdon NNR and Cwm Idwal NNR. The Snowdon Lily was first recorded by (and named after) the famous Welsh botanist Edward Lhuyd. As Keeper of the Ashmolean Museum in Oxford, Lhuyd (nowadays spelt Lloyd) undertook journeys far and wide to collect and record plants, and his trips to Wales yielded at least 50 Welsh 'firsts'. The naming of Lloydia serotina after him was in honour of the outstanding work he carried out in recording wildflowers in Wales. 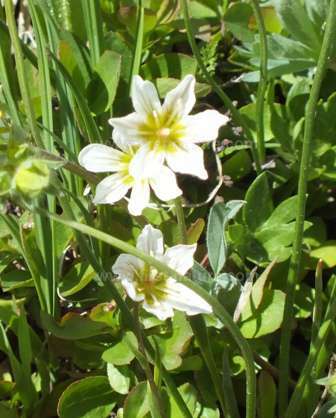 The Snowdon Lily was first placed in the genus Anthericum, but studies revealed that there were enough differences to justify it being placed in a genus of its own - Lloydia. Snowdon Lily grows to around 12cm in height, has white cup-shaped flowers veined with white or mauve, and has wiry leaves - the latter being recognised in one of the plant's earlier common names, Spiderwort. This wildflower blooms from May until the beginning of July. Above: Lloydia serotina flowering in Rocky Mountain National Park in America where this rare (to us in the UK) plant is called Common Alp Lily! The plant has suffered badly, both from being collected and as the result of grazing by farm animals. 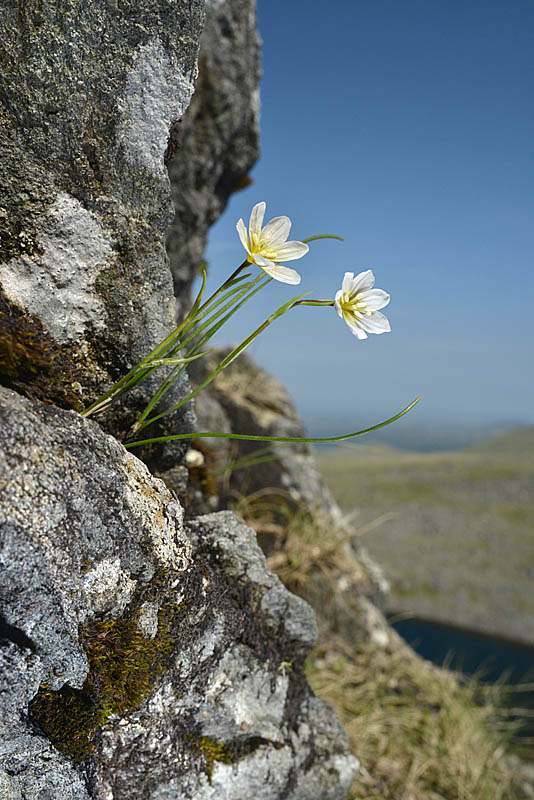 It is fortunate that, in Britain at least, the Snowdon Lily is able to grow straight out of bare rock crevices and on mountain ledges that are often only accessible via a rope. Today there remain a small handful of places where this lovely wildlfower can be seen. Along with other plants that grow in inhospitable places, it seems that the Snowdon Lily may employ more than one strategy for its survival. In such harsh weather conditions, pollinating insects which would assist with cross-pollination are often in short supply, but Lloydia serotina is also able to self-pollinate. It can achieve this when the flower is open and the anthers fall forward to deposit pollen on the stigmatic surface of the same flower, or even when the flower is still in bud. This strategy is also used by some wild orchids - Violet Limodore, Limodorum abortivum, for instance.